Trailing your combine head with a Horst CHC Wagon keeps you moving with safe and easy road travel. The no-sway design of Horst’s running gear provides a smooth trailing wagon that eliminates the zig-zag action through tapered roller bearings on all the main pivot points. This includes the king-pins and steering pivot joint. The predictable trailing movement of Horst’s Header Wagons is especially important for combine operators who don’t have a clear rear-view and need to rely on a steady trailing wagon. 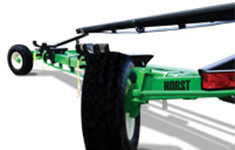 Sturdy yet flexible, Horst CHC Wagons are made with double tube construction designed to handle uneven ground reliably. For road travel, heavy-grade tires with low wearing tread is standard on all models. An optional light kit is also available for increased visibility during nighttime driving. Get from field to field quickly and efficiently with a quality built Horst Combine Header Wagon that handles your header safely and travels smoothly. Take the hassle out of transporting wide heads from field to field with the 4-wheel steer Contour header wagon. Built with all the same features as the standard model, the Contour adds greater maneuverability with 4-wheel steering which is ideal for combine heads 30-feet and longer. Trailing behind the combine or vehicle the Horst Contour follows the same tire tracks when cornering. If your combine can make the turn, so will the Horst Contour header wagon. Trailing behind the combine or vehicle the Horst Contour follows the same tire tracks when cornering. If your combine can make the turn, so will the Horst Contour Header Wagon. The Contour Header Wagon matches the sharp turning performance of your combine for easy turning. The rear wheels are linked mechanically and steer in the opposite direction as you begin turning. This keeps the wagon on track with the turning arc of the tow vehicle, passing through narrow entrances easily. Draperheads have never been easier to load and unload with Horst’s new draper header mount. The exclusive draper mount is designed with a greater landing surface which makes lining up the header and wagon effortless. The draper header mount adjusts on three axis, left to right, forward and back, and up and down. This triple adjustment feature ensures that each resting point is perfectly positioned for your draper head. Easily reposition the header mount by simply lowering the over-centre locking handles. The durable ratchet strap secures the head and prevents shifting and bouncing during road travel. The wrench stores on the wagon, ready when you need it. Makes sure wagon fits most sizes and models of combine heads.